Dr. William Code is an anesthesiologist, integrative medicine specialist, and acclaimed international speaker and author. A medical practitioner for forty years, he has studied integrative medicine under Dr. Andrew Weil at the University of Arizona, and is a leading expert in pain management. He has had his own twenty-two year journey with MS. 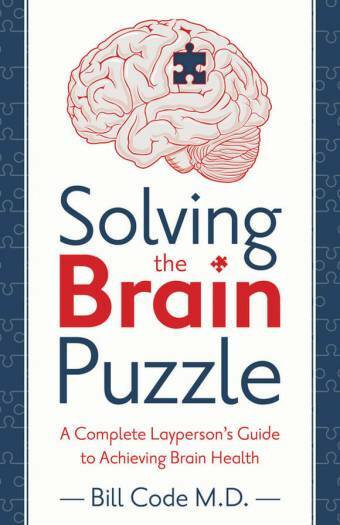 Solving the brain puzzle is an encyclopedic tour-de-force for the physician or patient to deal with the prevention and treatment of the major illnesses of aging: Alzheimer’s disease, multiple sclerosis, Parkinson’s disease, strokes, traumatic brain injury, vascular insufficiency, and many others. It offers a huge variety of therapeutic agents including oxygen and hyperbaric oxygen therapy, cannabinoids, pain treatments, gut flora enhancement, exercise treatments for iron excess, vascular surgery, elimination diets, supplements, detoxification, meditation, and many, many others.